Philip Lowry on his debut for Portadown against Crusaders. Pic by PressEye Ltd.
Portadown suffered a fifth consecutive Danske Bank Premiership defeat as Joshua Robinson forced home the game’s only goal to seal victory for Crusaders. 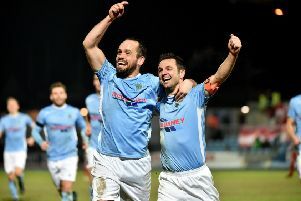 The defending champions left Shamrock Park with a single-goal success as Robinson’s near-post header diverted home a Craig McLean corner-kick delivery on 90 minutes. Billy Brennan proved unconvincing in the opening minutes when Billy Joe Burns’ punt into the penalty area had the goalkeeper scrambling back to tip the effort on to the crossbar. Paul Heatley proved a threat along the left - with one shot deflected wide then another saved by Brennan immediately before the break. Brennan was on hand to block a low Jordan Forsythe drive off Burns’ free-kick pass as Crusaders held the upper hand across the first half. However, clear sights of goal proved limited and Colin Coates’ diving header failed to steer on target a Forsythe cross. Gary Twigg’s shot on the turn lacked accuracy but offered the only attacking threat from the hosts - with Portadown unable to offer Philip Lowry an opportunity to shine on his debut. Crusaders carved out a golden opportunity just past the half-hour mark when Heatley’s cutback arrived for Jordan Owens in a central position but his sidefoot shot dropped wide. Ken Oman and Chris Casement failed to halt Michael Carvill’s progress along the left after the interval but Owens’ looping header off the resultant cross dropped short of the line. Mark McAllister’s driving run down the left was blocked by a Robinson sliding challenge. Portadown came close to grabbing an injury-time equaliser but Twigg’s header off a Robert Garrett cross was pushed over the bar by Sean O’Neill. PORTADOWN: Billy Brennan, Chris Casement, Ross Redman, Keith O’Hara, Sean Mackle, Mark McAllister, Philip Lowry, Michael Gault, Gary Twigg, Robert Garrett, Ken Oman. Subs: Tim Mouncey, Marcio Soares (on for McAllister, 66 mins), Matthew Parker, Padraig Judge, Mark Carson. CRUSADERS: Sean O’Neill, Billy Joe Burns, Colin Coates, Joshua Robinson, Craig McLean, Declan Caddell, Matthew Snoddy, Michael Carvill, Jordan Forsythe, Jordan Owens, Paul Heatley. Subs: David Magowan, Richard Clarke, Andrew Mitchell, Diarmuid O’Carroll (on for Heatley, 84 mins), Gavin Whyte (on for Forsythe, 14 mins).